It wasn’t quite the homecoming that he expected, but Aliu Bamidele Lasisi at least ended the night with his unblemished record still intact. The Dubai-based super flyweight survived a stiff challenge from Nicaragua’s Ricardo Blandon to prevail via unanimous decision Friday evening at Emirates Golf Club in Dubai, United Arab Emirates. Scores were 114-111 across the board in favor of Lasisi, who survived an early knockdown and point deduction to floor Blandon late in sealing the victory. 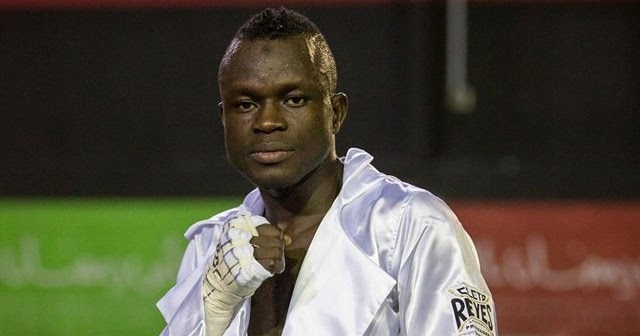 Lasisi—a Nigerian prospect based in Dubai—was fighting in his adopted home country for the fifth time in his young career. None were as physically grueling as Friday’s affair, which headlined the maiden telecast of the newly launched Dubai Fight Night on ESPN+ presented by MTK Global, by whom Lasisi is managed. Things were going well for the unbeaten boxer in the early going but reminded at every turn that he was indeed in a fight. Blandon turned the tide in round three, sneaking in a right hand during an inside exchange to floor a stunned Lasisi for the bout’s first knockdown. A clash of heads in round four left Blandon physically worse for the wear with a cut over his right eye. Equally as damaging, however, was the point deduction Lasisi suffered for the accidental foul. It put him in a hole on the scorecards, as all three judges had him trailing through four rounds in their spirited if not awkward affair. Blandon’s grind-‘em out style gave way to Lasisi’s superior skill set, with the crowd favorite pulling within even on two cards and ahead on the third through eight rounds. However close the bout was heading down the stretch, Lasisi made sure to close the show. A physically imposing round nine was immediately followed by a fight-clinching knockdown early in round ten. Blandon paid the price in forcing a phone booth war, getting clipped with a flush left hook to send him to the canvas. The threat of a knockout didn’t quite surface, nor was Lasisi completely in the clear. He foolishly left an 11th round very much on the table, a frame which tipped in favor of Blandon (10-2, 4KOs) courtesy of a right hand shot just before the bell. Learning to leave nothing to chance, Lasisi reclaimed momentum in the 12th and final round. He was ahead just enough on the scorecards to that point, but outworked Blandon effectively enough to sweep the frame and secure the win. Lasisi improves to 13-0 (8KOs) with the win. The 28-year old was forced to go 12 rounds for the first time in his career, barely three months after going a previous career-long 10 rounds in his most recent contest last December. oooooooo lasini just got dropped!!! !